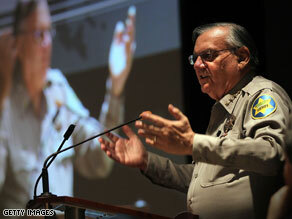 Joe Arpaio says he will consider a run for the governor's seat over the weekend. Phoenix, Arizona (CNN) - Joe Arpaio, the tough-talking and controversial Arizona sheriff from Maricopa County, says he will consider a run for the governor's seat over the weekend. Responding to reports that he had already made a decision, Arpaio firmly told reporters Friday that, "I am not running for governor now until I decide over the weekend with a glass of wine and my wife, since my mother and father came here from Italy, with a little spaghetti and meatballs." His remarks followed a major raid in which 73 undocumented immigrants were taken into custody. The sheriff - whose showy brand of justice has raised charges of discrimination and civil-rights abuses while making him a hero among fans of his tough-on-crime attitude - is a staunch supporter of Arizona's new immigration law, which will allow police to demand proof of legal residency when it goes into effect in 90 days. EPA administrator Lisa Jackson said Friday there is a chance that workers will be able to stop the flow of oil into the Gulf of Mexico. 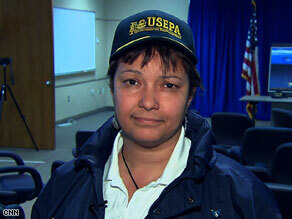 (CNN) - EPA administrator Lisa Jackson said Friday there is a chance that workers will be able to stop the flow of oil into the Gulf of Mexico, but warned that the EPA is preparing for the worst. "There is still the opportunity and the possibility that they would be able to shut it down," Jackson told CNN Chief National Correspondent John King. "Of course as responders we have to look at the worst case, and keep planning for that." Jackson's comments come as the federal government is ramping up the pressure on BP to do more to stop well leaks gushing thousands of barrels of oil into waters off Louisiana. The government is also pushing BP to beef up its response as a giant oil slick approaches the Louisiana coast. (CNN) - The governor of Florida, now running an independent bid for senate, says sour grapes didn't lead him to leave the Republican primary. Gov. Charlie Crist told CNN Chief Political Correspondent Candy Crowley that he is aware of criticism that he withdrew from the primary only after his political fortunes fell against former Florida House Speaker Marco Rubio, who is expected to win the Republican nomination handily. "That's what parties do and that's part of the biggest problem … all they're going to do is attack each other all day long. People like this, they go home and watch cable television, watch broadcast television and they see those kinds of arguments and it breaks their hearts," Crist said in an interview to be aired Sunday on CNN's State of the Union. "They see bickering, and they see nobody standing up and saying, 'We're all Americans, we've gotta to work together.,'"
Crist will face off against the party nominees – likely Rubio and Democratic Rep. Kendrick Meek - in November. Several other candidates have qualified for the election without party affiliation, but none are expected to seriously contend for the seat. 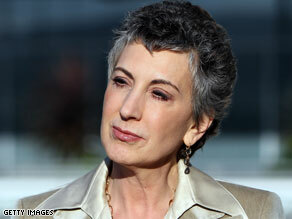 California senate candidate Carly Fiorina weighed in on immigration reform and U.S. offshore drilling on Friday. Washington (CNN) - California senate candidate Carly Fiorina weighed in on two issues currently inflaming political debate: immigration reform and U.S. offshore drilling. Specifically regarding Arizona's controversial immigration law, the candidate, who is vying in a Republican primary for her party's nomination, said that, "The people of Arizona did what they felt they had to do." "I support their need to protect their citizens," Fiorina told Wolf Blitzer in an interview that aired on CNN's The Situation Room. "But what we ought to be talking about is the federal government needs to secure the border." On the issue of comprehensive immigration reform, the former chairman and CEO of computer giant Hewlett-Packard outlined what, she believes, is a more urgent issue. "Without one new piece of legislation, the federal government has the power and the responsibility to secure the border and to come up with a temporary program - a temporary worker program that works," Fiorina said. "That's what the federal government needs to do. Forget trying to change the subject and talk about comprehensive immigration reform." President Obama and U2 lead singer Bono met on Friday at the White House. Washington (CNN) – President Obama and U2 lead singer Bono met on Friday at the White House following the star's recent trip to Africa. "[They discussed] ways to make sure our foreign aid is effective, and the opportunities for innovation and technology to change the development landscape in Africa," National Security spokesman Mike Hammer told CNN. Obama's meeting with the singer was not on the White House schedule. 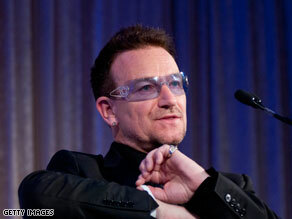 It was Bono's philanthropic organization, ONE, that announced Friday's meeting. "With the first blackberry president, we discussed the power of new technology to empower activists and entrepreneurs across Africa, part of a new rising generation that's boosting growth and governance and defying stereotypes," Bono said in a statement released by ONE. 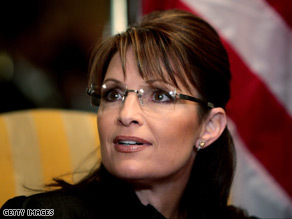 Sarah Palin took to Facebook on Friday to comment on the oil spill in the Gulf of Mexico. (CNN) - As thousands of barrels of oil leak into the Gulf of Mexico, and a massive oil slick approaches the Louisiana coast, Sarah Palin weighed in on the environmental nightmare. In a Friday post on her Facebook page, the former Alaska governor expressed shock and sadness for the 11 men presumed dead from the April 20 oil rig explosion. And Palin said that her "heart breaks" for Louisiana's coastal residents who are "facing fears of the unknown impacts of the oil spill." She also called for increased government accountability in the oil industry, saying that while accidents will always happen, companies "must be held accountable." "It is inexcusable for any oil company to not invest in preventative measures," Palin wrote, while also mentioned her experience as an oil and gas regulator. But Palin is standing by the rally cry she helped popularize during the 2008 presidential campaign. "I repeat the slogan 'drill here, drill now' not out of naiveté or disregard for the tragic consequences of oil spills – my family and my state and I know firsthand those consequences," Palin wrote. "[I]ncreased domestic oil production will make us a more secure, prosperous, and peaceful nation." 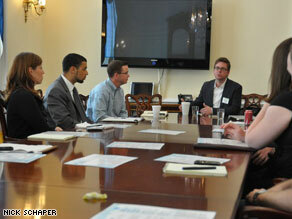 Twitter co-founder Biz Stone meeting with GOP House staffers. Washington (CNN) - Twitter co-founder Biz Stone met with congressmen and staffers on Capitol Hill this week to talk about his microblog that sends out messages in 140 characters or less. Stone provided an overview of Twitter, discussed new features his team was working on such as geo-tagging and iPhone applications, as well as offering tips on how to most effectively use the site at a Friday morning meeting with House Democratic staffers. "We asked Biz for more characters per Tweet; it's hard to fit how we are reforming Wall Street, fixing the health care system and turning our economy around in just 140 characters," Rob Pierson, director new media for the House Democratic Caucus, said in an e-mail to CNN. In a separate meeting, Stone answered questions from a handful of GOP leadership staffers on the subjects of usability and effectiveness. "We had a great conversation about the changing landscape of media and congressional communications," Nick Schaper, director of new media for House Minority Leader John Boehner, said in an e-mail. "As the House GOP continues their aggressive use of social media, it's important that we work closely with industry leaders like Twitter to ensure we're using the best tools available to listen to the American people." 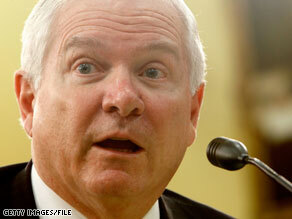 Robert Gates is warning Congress not to change rules about gays in the military until the Pentagon finishes its review. Washington (CNN) - The secretary of defense is warning Congress not to change the rules about gays in the military until the Pentagon has reviewed the impact of repealing the laws on the force. In a letter sent to the House Armed Services Committee's chairman on Friday, Gates wrote he is "strongly opposed" to any changes to the "don't ask, don't tell" legislation before the military review is completed. "I hope Congress will not do so, as it would send a very damaging message to our men and women in uniform that in essence their views, concerns, and perspectives do not matter on an issue with such a direct impact and consequence for them and their families," Gates wrote in the letter, which was obtained by CNN. Gov. 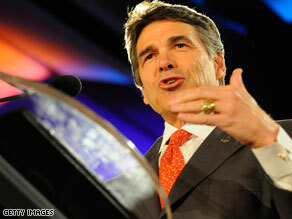 Rick Perry of Texas said Friday he has concerns with portions of the law passed in Arizona. Washington (CNN) - All four governors of U.S. states that border Mexico have now weighed in on the controversial Arizona immigration law. The only one defending it is the governor who signed it into law, Arizona's Jan Brewer. The latest state chief executive to criticize the Arizona measure is Republican Rick Perry of Texas. "I fully recognize and support a state's right and obligation to protect its citizens, but I have concerns with portions of the law passed in Arizona and believe it would not be the right direction for Texas," Perry said in a statement issued Thursday. Political fallout for Obama amid oil spill disaster? Washington (CNN) - As the oil slick from the recent offshore oil rig disaster makes its way to Gulf Coast shores - expected to devastate the precious ecosystem and hurt struggling businesses - the seeds of political fallout for the Obama administration are beginning to sprout. Conservative radio talk show host Rush Limbaugh said on his program that the oil slick disaster is "Obama's Katrina." "Media conservatives have rushed to absurdly compare the Obama administration's response to a catastrophic oil spill in the Gulf of Mexico to the Bush Administration's botched response after Hurricane Katrina, a hurricane that left more than 1,500 dead," the liberal-leaning group said on its website. "This claim is undermined by a number of facts."